^ Ott, Michael (1912). 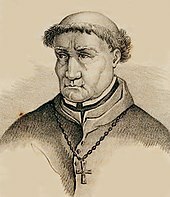 "Tomas de Torquemada" . In Herbermann, Charles. Catholic Encyclopedia (in English). 13. New York: Robert Appleton Company. ^ "Meditations, or the Contemplations of the Most Devout". World Digital Library. 1479. Duran, Alphonsus Maria, Why Apologize for the Spanish Inquisition?, (Eric Gladkowski, Ed., 2000). ISBN 0-9702235-0-1. Kamen, Henry, The Spanish Inquisition: A Historical Revision, (Yale University Press, 1999). ISBN 0-300-07880-3. Taunton, Ethelred Luke (1911). "Torquemada, Thomas" . In Chisholm, Hugh. Encyclopædia Britannica (in English). 27 (11th ed.). Cambridge University Press. Walsh, William Thomas, Characters of the Inquisition, (Tan Books and Publishers, 1987). ISBN 0-89555-326-0 .